This column was written by Rebecca Tinkelman. 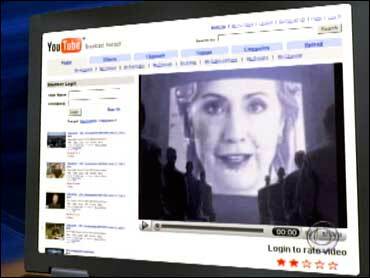 The 2008 presidential candidates want you to know that they know their way around YouTube. Hillary Clinton, Barack Obama, John Edwards and Sam Brownback all announced their candidacies on the video-sharing site, and an official page hosts videos from 17 candidates. Some commentators are calling this the YouTube election. So far, it seems as if everyone has figured Web video out but the candidates. No one's talking about the video of Sam Brownback's speech in Ames, Iowa, but most of us have seen John Edwards primping to "I Feel Pretty," or Hillary Clinton speaking to a zombified audience in a parody of an old Mac computer ad. John McCain took a hit for singing "Bomb Iran." And then there's Obama Girl. These videos, short clips that play on viewers' concerns about candidates (is Edwards just a pretty face? Is McCain a little too excited about war? Is Obama really that hot? ), have sparked extensive coverage from the mainstream media and helped crystallize candidates' public image. In return, few of the candidates have posted anything but videos of speeches and rallies, which have all the excitement and panache of C-SPAN. Even on the rare occasion when the campaigns get creative, the results feel flat. Edwards' campaign played up his friendly Southern image by filming two of his top aides trying, and failing, to bake his mother's pecan pie. On June 19 Clinton announced her new campaign song (Celine Dion's "You and I") in a video spoofing the final episode of "The Sopranos." The point, presumably, is to demonstrate that they have a sense of humor — but it's not all that convincing. The best of the bunch are by Mitt Romney. In addition to the usual copies of television interviews, his site contains videos narrated by his son Tagg, which intersplice speeches with quotes from excited volunteers on why they love their candidate. The video holds a viewer's attention and projects an infectious enthusiasm that feels spontaneous. But U.S. presidential candidates aren't the first politicians to explore Web video — officials in Europe have already been experimenting with the genre. In Britain, David Cameron, leader of the conservative Tory party, has developed WebCameron, a personal Web site featuring blogs and videos. The first video, announcing the launch of the site, features Cameron in his kitchen, washing up after his kids while chatting to the camera about his new project. Subsequent videos show the party leader visiting "ordinary" people — tailing a police officer in South Wales (a video disappointingly free of wild car chases), acting as a teacher's assistant and visiting a mosque. In a standard clip, Cameron talks with the people he's meeting, asking them about their problems, and then delivers a short speech summarizing the issues confronting the group he spoke with and how he would help solve them. The message, of course, is that Cameron — and, by extension, his party — cares about the common man and can be counted on to solve problems. WebCameron was praised as a new political tactic by the British media: The Guardian pronounced it the Tory's "secret weapon." Feeling threatened, Tony Blair soon set up Labour:Vision on YouTube, with videos of his party's politicians giving speeches. In the recent French presidential election, Socialist candidate Ségolène Royal concentrated on creating an interactive Web campaign that would give voters unprecedented power over the way her campaign was run. While Hillary Clinton has staged interactive stunts such as inviting visitors to her site to choose her campaign song, Royal went much further. The opening image on Royal's Web page featured a photo taken by a supporter. The main page of her site showcased blogs written by other supporters as well as user-created videos, some of which were viewed more than 2 million times. Royal even asked people to decide what her platform should be. "In effect, she gave up an amount of control over both message and substance to an extent unprecedented for a major political leader," wrote Colin Delany at techPresident, a site that scrutinizes candidates' use of the Internet. It is worth noting that Royal lost in a landslide to Nicolas Sarkozy. He had a different approach to Web video, posting mainly footage of rallies and campaign videos, as well as humorous takes such as DiscoSarko, featuring a cartoon Sarkozy dancing, designed to soften the candidate's severe image. It's hard to tell how much effect the Web campaigns had on the election. Sarkozy was polling ahead from the beginning, and the growth of a far-right party suggests that the French public was becoming more favorable to conservative platforms. It could not have helped, however, for Royal to have given up so much agency over her campaign to a virtual constituency. Even the most popular videos on political Web sites are remarkably shallow. The most popular posting on Labour:Vision is a skit in which comedian Catherine Tate ambushes Blair in his office, a video that has been viewed more than 500,000 times in three months. An interview with Blair about climate change? Only 1,700 views over eight weeks. David Cameron's Normal Guy campaign doesn't tell us anything about what his party stands for, while Royal's ambivalent site suggests that she stands for nothing. Web video is at its best unscripted and uncontrolled. Videos are most effective when they accidentally catch hold of something funny or disturbing and then manipulate it. But campaigns need to control their message, and their videos need to consistently reinforce that message. Their messages require scripts and lighting and the help of advisers. In this campaign, outsiders have used Web videos to make effective and cheap attack ads, but it seems unlikely that any of the candidates' videos will have much of an effect on voters' decisions.